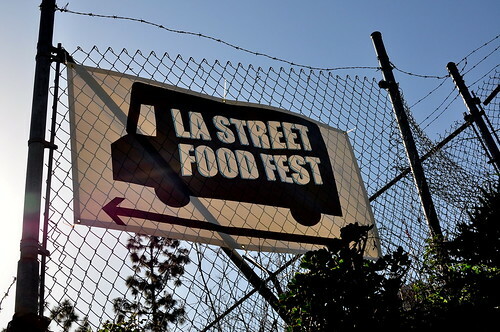 Even though I was warned by the Twitterverse of hour-long lines and have experienced firsthand the utter chaos of large-scale food events (See: Grilled Cheese Invitational and Great American Food and Music Fest), missing out on the first annual LA Street Food Fest was completely out of the question—I live for meals on wheels! 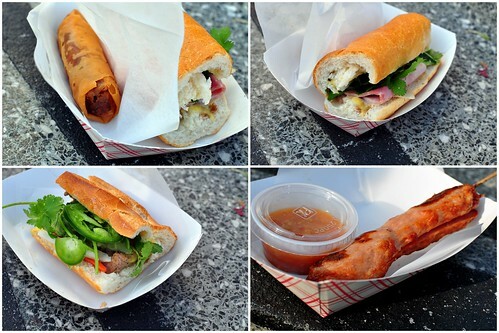 I am not alone in my passion for street eats. 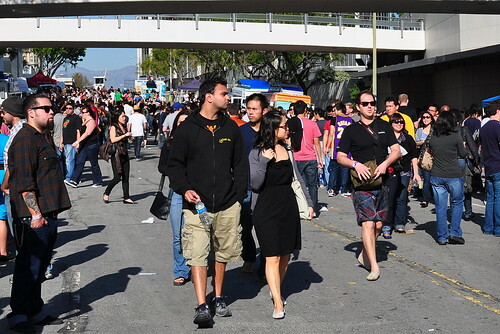 Fifteen-thousand Angelenos descended upon LA Center Studios in downtown this past Saturday to stuff their pie holes with Brazilian acaraje, Japanese hot dogs, Mexican huarache, and so much more. 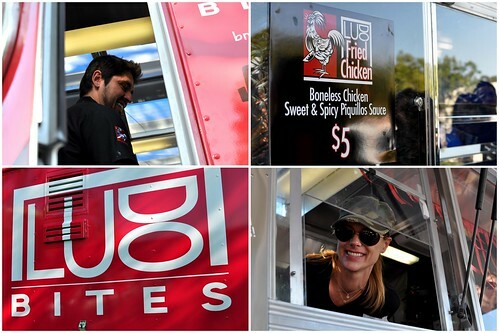 The thirty-five trucks at the festival were armed and mostly ready to feed the masses. Even though lines seemed to snake on forever, nearly all of the vendors managed to bring enough food to last the entire day. Those who endured the lengthy waits were rewarded for their efforts. Hands-down the most popular truck of the day was Chef Ludo Lefebvre‘s pop-up fried chicken mobile. In true Ludo Bites fashion, Krissy ran the front of the “house,” while Ludo and his brigade churned out fresh bites in the back. Hungry folks hankering for a piece of LFC waited upwards of two hours for a taste. Luckily, we were able to finagle a piece from our friend Mattatouille, who was helping out on the truck. Cutting in line is admittedly bad form, but Ludo’s fried chicken elicits bad behavior. The fried chicken was comprised of various pieces of boneless dark meat held together by a crisp batter. The meat was juicy as heck, while the crust was superbly seasoned. The side of sweet and spicy piquillos sauce was a nice touch—everyone loves to dip their nuggets. 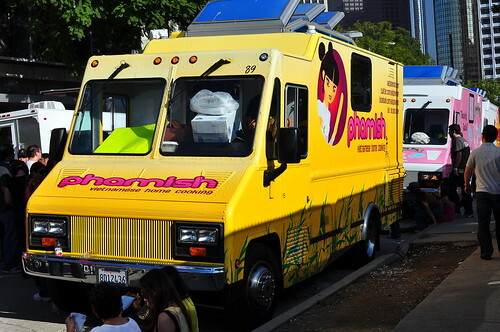 The Astronomer took one for the team and waited forty-five minutes at the Phamish truck (@eatphamish), which specializes in Vietnamese home cooking. While my boy was diligently waiting in line, I met up with my pals Sook and Sarah, and we kicked it with Jonathan Gold. Woot woot! 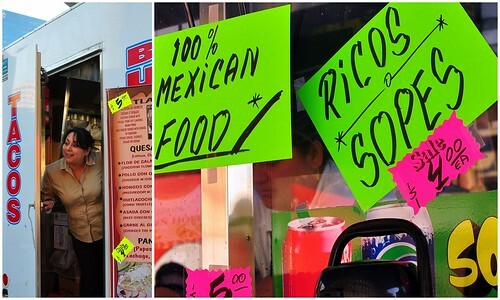 We talked about good food, Pasadena, and good food in Pasadena (not!). 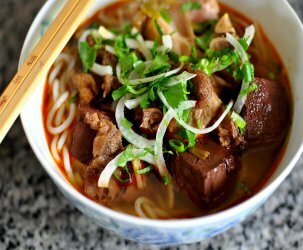 When The Astronomer finally arrived on the scene, we dug into one very mushy cha gio, one sad nem nuong skewer, and two stale banh mi sandwiches. All of the food tasted like it was made the day before and with indifference. Mr. Gold quipped that the nem nuong had a Kibbles ‘n Bits-like quality to it. Hilarious. I’d like to give Phamish another go when the crowds have simmered down. 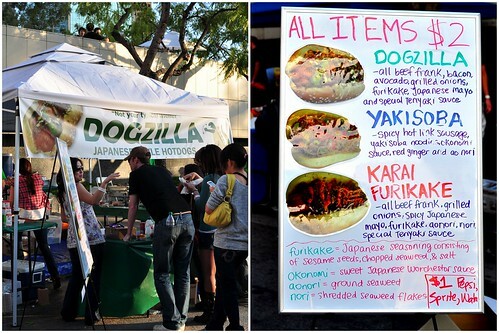 Next, we moved onto Dogzilla’s Japanese-style hot dogs. Served on lightly toasted King’s Hawaiian Bread, the spicy sausage was topped with bacon, avocado, caramelized onions, furikake, Japanese mayo, and teriyaki sauce. The wiener was interesting, well-balanced, and quite tasty. 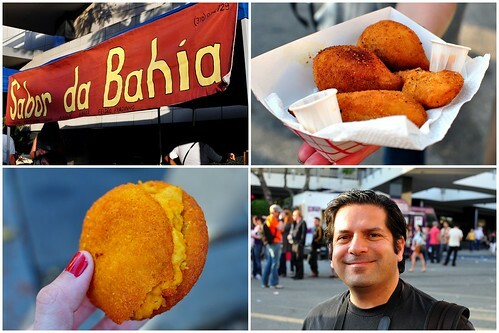 Following wiener time, we met up with my friend Bill for Brazilian street food at Sabor da Bahia. I indulged in a warm acaraje, a traditional Bahian street food made of black eyed peas fried in dendê (palm) oil. 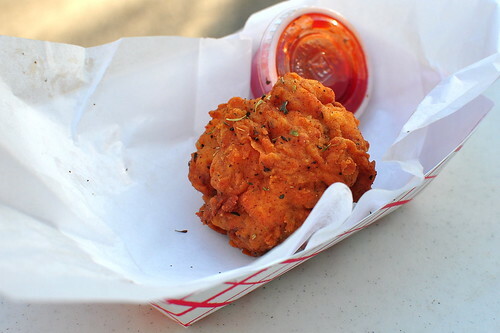 The fritters were served with a hotter than hot malagueta pepper sauce. We also shared some coxinha de galinha, drumstick-shaped bites filled with savory shredded chicken and cream cheese. 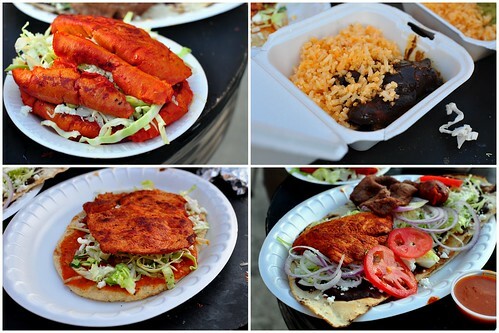 Our last stop of the day was at Antojitos de la Abuelita, a cart specializing in Mexico City-style street food. Mr. Gold procured a huge spread for our group to share. It included huarache with cecina (dried beef); clayuda (Mexican “pizza”) with chorizo, tasajo (thinly sliced and seared beef), and cecina; mole verde (green) with chicken; pambazo (Mexican “French dip” in chile guajillo sauce filled with potatoes and chorizo); and Oaxacan mole. 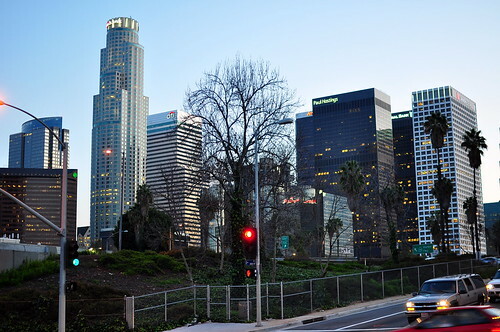 I love this city. Check out the complete set of photos via Flickr. Hi. Just wanted to say that I love the blog. I reached it via HoustonWok’s blog but I remember coming across it googling a pate chaud recipe. Anyways I love it! Keep it up! i’m so bummed that i missed out! phamish intrigues me, although something tells me that it can’t be as good as little saigon fare. oh well, next time. And, I can see JG was completely overjoyed to have his picture taken yet again. Catherine, I truly believe if you had gotten involved with organizing this thing, rather than eating, it wood have truly been more festive and the common complaints muted. I wish I could have gone! Alas I was working =( looks like fun! And what a lucky girl hanging out with the JGold!!! Whenever we hang at a festival, it becomes a funstival. Just like there’s no I in TEAM, there’s no fun in a street fest unless we’re there sittin’ on a stoop eating and drinking from sticks and paper trays. Now, that’s a lady ewho knows how to have a good time. This was a great festival indeed, and it was a party on our end of the spectrum. Fun!! Thank you for the review! I so wished I could have joined the fray and indulged my food truck fetish! The coxinha de galinha sound interesting! 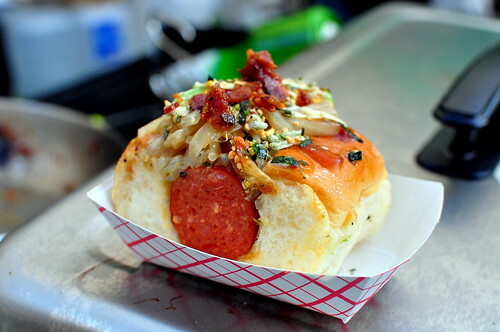 Lucky you for getting to try Dogzilla! We couldn’t brave the lines for most of the trucks…they were just too long and the heat was starting to get to us. And plus, we had some trouble even finding the end of the line for some trucks! Did you try Mama Koh’s chicken? Quite tasty even if they weren’t crispy enough. The more I read, the more jealous I get. Maybe we should have braved the lines (although with a 14 month old in tow, it’s much harder!) 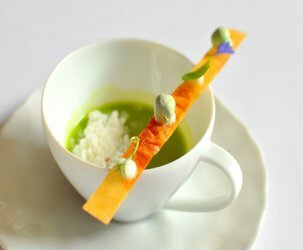 Really need to try acarajes… looks so good. Mmmm Ludo’s fried chicken … looks just as good as when he frys it up at the restaurant! Though not sure I’d have the patience for a 3 hour line! Looks like some good times hangin with the J. Gold & Co. Too bad about that day oldish tasting grub. My experience at this fest was awful. We got there at around 11:30 and the line was already around the next block with crowds pouring into the streets. Waited in line for about 2 hours and were 15 feet away from the entrance only to have the gate closed on us, even though we were told that as people left those of us in line would get in. It was poorly organized with a way too small venue. Too many people did not even get in. From what I could see it looked like once inside it was just un-organized long lines. This was terrible. Wish I could have tasted at least one thing. I was around the corner when the line came to a grinding halt! I hope I have better luck next year! Catty Critic, I understand your sentiment. I’d punch me if I were you. The lines were irritably long and probably the biggest failure of the event. Inside the truck, we felt really bad that people had to wait so long, but we could only fry the chicken so quickly. People still complained that the chicken wasn’t cooked enough, but we were very keen on temperature testing each piece so that it was safe. I hope that when they do this again next year, they will organize that aspect a little better. Some great pictures here. Dogzilla looks really interesting – I’ll have to try it sometime. I was one of the people who waited 3+ hours total for the fried chicken, and I’m really glad I didn’t ditch the line. About 90 mins in, someone came out to say that we’d probably spend the rest of the festival in this line if we chose to stay, and I did. I was a little worried that the kitchen would try to hurry the last orders of chicken, especially as I got mine a little after 5pm. 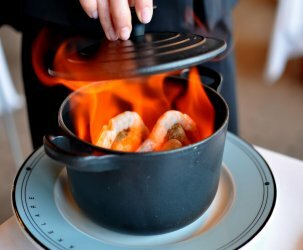 However, it wasn’t the case at all – it was cooked perfectly! *gasp* Matt! How could he! Too bad I missed you guys (and the chance to rub thighs with the J Gold ;P ) – left around 1 ish since the lines were starting to get crazy. Stuffed myself on LFC, Frysmith, and ice cream sammies tho! I’ll just have to catch the rest on their regular rounds on the street ..